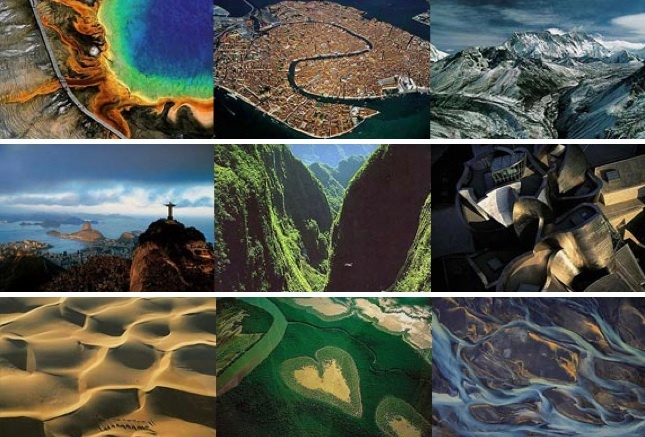 Environmental art has the power to change the way we view our world. Some artists showcase the innate beauty in nature, while others make a statement with agit-prop or controversial imagery. Here are 20 powerful and unforgettable works whose artists seek to make you rethink your relationship with the Earth and its creatures. Earth from the Air by Jann Arthus-Bertrand. A photographic documentation of the planet. Not just pictures, but portraits, showing a sense of place in many places around the world. The Litmus Garden designed by T. Allen Comp. 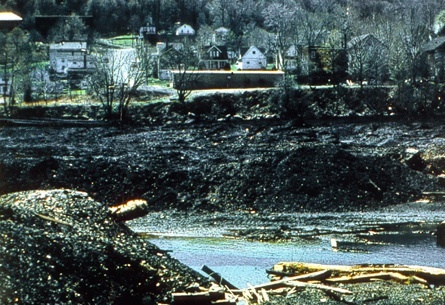 With the help of over a hundred volunteers over an April weekend in 2001, a toxic river of coal mining waste was transformed into a series of cascading pools that eventually filter and clean the water before it flows into Blacklick Creek in Vintondale, PA. Different trees have been planted at the edge of each pool which reflect the different colors of the water as it purifies. RiverCubes by Bob Johnson. 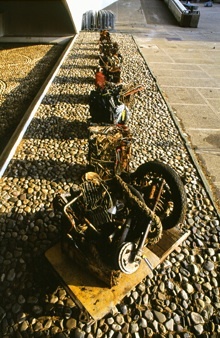 The artist harvested debris found in local rivers and created sculptures of trash to be displayed nearby. The resulting “cubes” are ugly displays of plastic and rusting metal, but are powerful commentaries on what humans leave in a landscape. Marsh Zone 2000 by Mark Brest van Kempen. 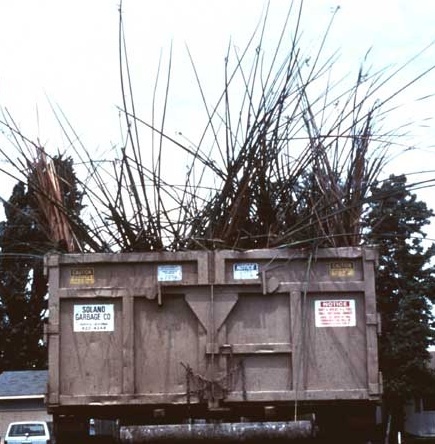 A large trash container was filled with remnants of a marsh which was the native ecosystem of Fairfield, CA, before it became a city. This container was moved around the city with special signs designating parking spaces for cattails, tule reeds and other plants that were there before the asphalt was. Editor’s note: video embedding is having a hiccup – here’s the link to watch the video on Youtube in the meantime. Thanks for your patience, everyone! Rivers and Tides by Andy Goldsworthy. This 2001 film is a treasure, bringing environmental art into the public eye as it documents Goldsworthy’s playful and observant works using only the natural materials at hand to create something even more beautiful than nature itself. Crude Awakening by Dan Das Mann and Karen Cusolito. 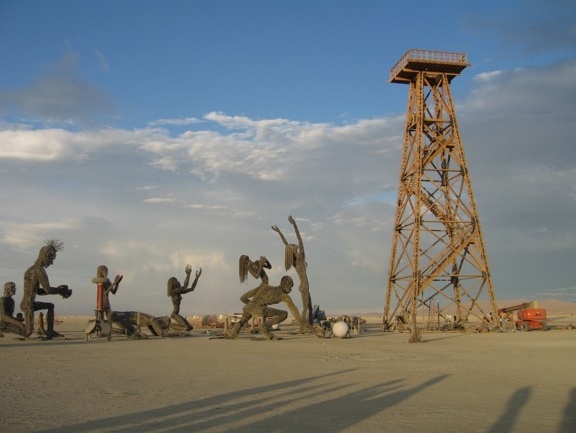 An installation at 2007’s Burning Man, a huge oil derrick was erected and surrounded by worshipping figures. One night, fireworks exploded over the derrick, climaxed by a huge fireball burning 900 gallons of jet fuel and 2,000 gallons of liquid propane. The derrick burned to the ground, symbolizing the end of our addiction to oil. Zero Circles by Daniel Dancer. 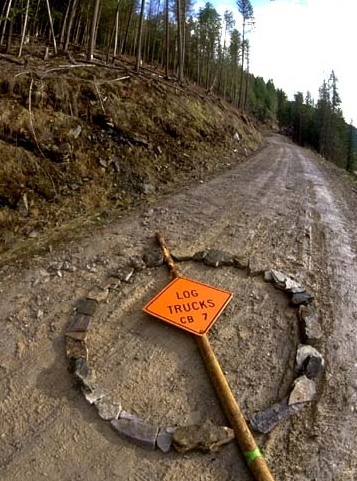 Circles of stone placed on logging and mining roads on public lands, these installations are meant to raise awareness of private profits made from mining, logging and grazing on public lands. Time Landscape by Alan Sonfist. 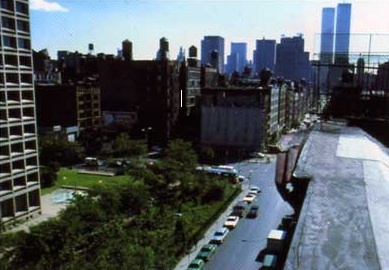 A radical art proposal for its time (1978), Sonfist planted a vacant lot in Manhattan in with trees that were native to the area before New York became the city it is today. He has gone on to create other historically accurate landscapes around the world. 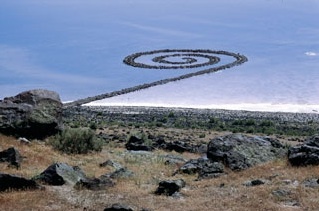 Spiral Jetty by Robert Smithson. A stone jetty built into the Great Salt Lake of Utah, this earthwork has been submerged and exposed over the years since it was created in 1970. As of February 2008, there has been a proposal for exploratory oil drilling in the lake, 5 miles away from the Jetty. This drilling could ruin this work of art as well as degrade the surrounding environment. A Sheep In Wolf’s Clothing by Sam Easterson. 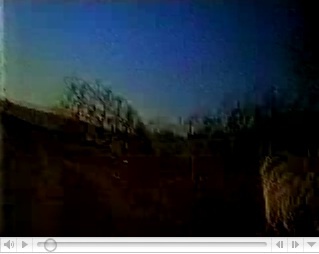 A video artist, Easterson was curious about seeing the world from an animal’s point of view. He straps tiny helmet-cams onto sheep, buffaloes, tarantulas and more. His goal is to put together the largest library of video captured from the viewpoint of animals and plants. 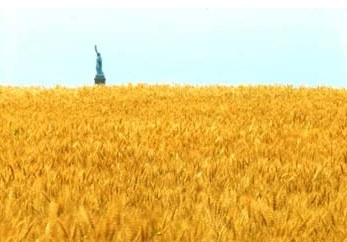 Agricultural Compositions by Jean Paul Ganem. 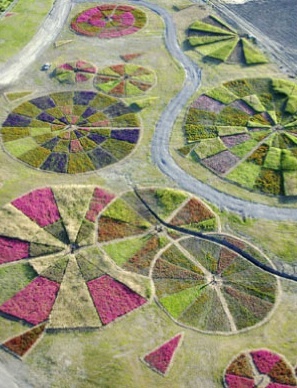 The artist turns fields of human waste and pollution into colorful landscapes made up of compositions of different kinds and colors of plants. Beautiful views from the air. Self-Portrait As Revealed By Trash by Tim Gaudreau. For an entire year, Gaudreau photographed all the trash he threw away. An eye-opening piece on the environmental impact of just one human. Surrounded Islands by Christo and Jeanne-Claude. 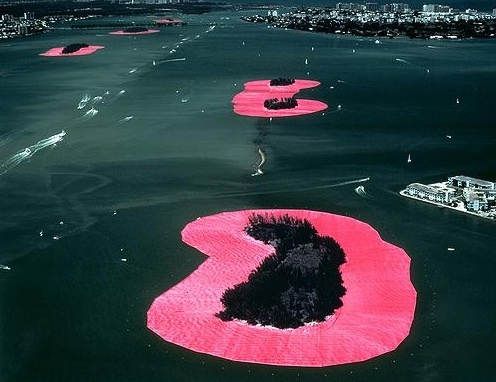 Certainly one of the largest scale installation pieces, this artistic couple created huge pink polypropylene sheets and temporarily surrounded 11 small islands off Miami with the plastic cloth. Their other works include wrapped trees and an “iron curtain” made of old oil barrels. Edible Estates by Fritz Haeg. Bringing public awareness to the pointlessness and waste of the suburban lawn, Haeg has created numerous regional prototype gardens of edible landscapes at various museums around the world, which include drawings and documentation as the gardens grow. 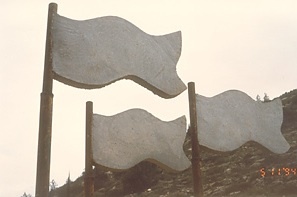 Concrete Flags by Shai Zakai. The artist wanted to bring attention to excess concrete that was being poured into a creek in Israel. Flag shapes were “cookie cuttered” out of dried concrete in the stream and displayed. This art was used to raise money to clean the cement debris and restore the creek to health. 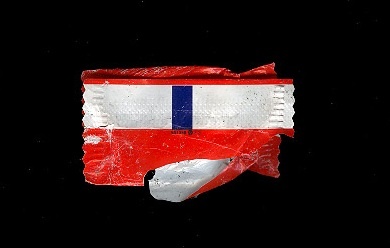 Trashlog by Nico Van Hoorn. 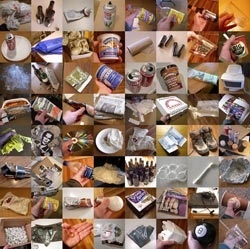 Bringing awareness to the abundance of trash in the streets, for three years Van Hoorn walked every day and picked up one piece of trash which he then scanned and posted to his website. The original trashy blog. Hundreds and Thousands by Diana Lynn Thompson. 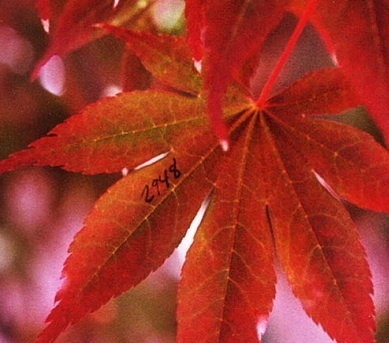 Intimately connect people with nature, Thompson spent an entire summer numbering every leaf on 5 trees in Bear Creek Park in Surrey. When the leaves fell, she (and a whole slew of helpers) gathered them up and pinned them to a museum wall. 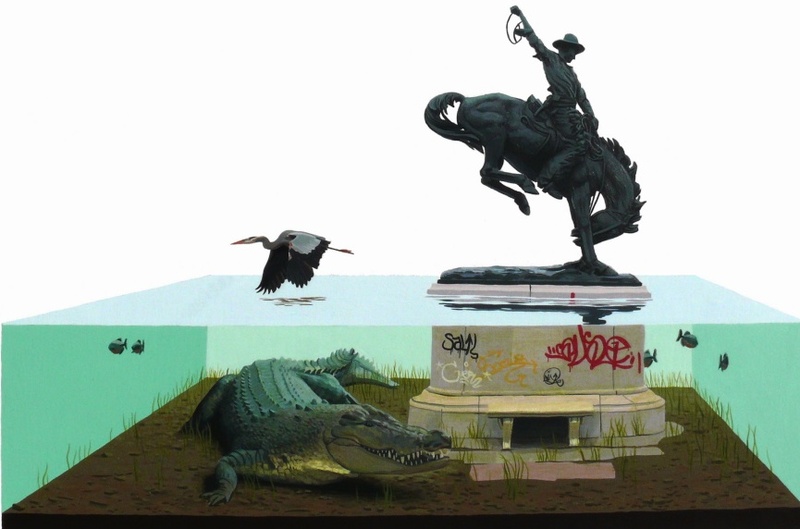 Micro Landscapes and Dissected Ecosystems by Josh Keyes. Slicing ecosystems down to their very core, Keyes’ paintings showcase tiny glimpses into what creates the little pieces of our world. Music For Animals by Jim Nollman. Wanting to bridge the gap between the species, Nollman makes recordings of himself playing music with animals – complete with the songs from the animals themselves. Editor’s note: Sara here. Honorable mention goes to environmental art in social media. “The shade of poison trees” by butler.corey is featured at the top of this post. 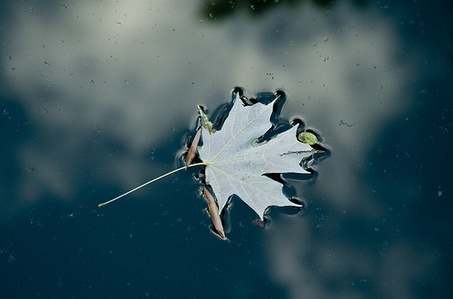 There’s something so haunting about a single leaf – and the tension of the water. If you enjoy this post don’t miss 15 Books That Will Forever Change How You See the World and 9 Life-Changing Inventions the Experts Said Would Fail.